What’s better than throwing a birthday party for your kids? How about having a party for you cat? That’s right, our furry little friends deserve the best in parties too and if you do this right, humans reap the benefits just as much as the tiny little kitties they are having parties for. Let’s be serious now, and get this purr-fect! Remember cats love treats, mice, milk rings, scratching boards, but they also crave human affection. 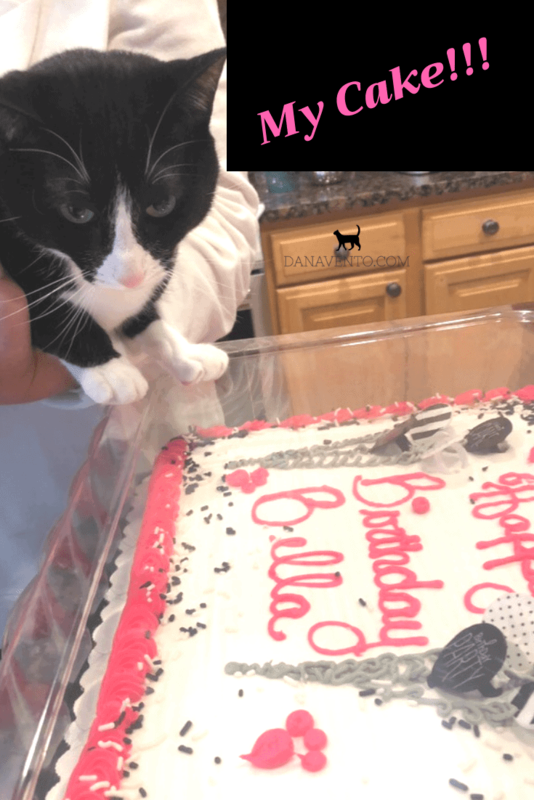 Bella the cat turns 6 and we needed to celebrate her birthday. After all, she is a part of the family too. Bella the cat is the hub of life in our home. Everyone talks to her, hangs with her and plays with her, so she totally deserves to be doted over right? All it takes is some simple planning, and the desire to just enjoy the moment! Remember you are going to want to take plenty of selfies with your kitty and of the cat because cats are so Instagrammable and fun! Here’s how to throw a birthday party for your cat and lavishly live life out loud! Call me crazy, but we are not the only people that throw our cat a birthday bash. Albeit probably more for the human enjoyment of food, it is for her. Bella loves new toys and attention (not at all!). No matter, we decided to do it anyway because birthdays are fun! The people where I got the cake think I am nuts, but that is ok too! It’s all about enjoying every minute we are given and that we do! Bella the cat is a Tuxedo cat we rescued years back. She has grown up with my kids. Every snuggle, purr, eyelash batting moment have been theirs to treasure, but we have to celebrate her more! How do you make the purrfect birthday party for your cat that humans will enjoy as well? First, you want to decide what color you need to make everything. We are kind of lucky because Bella’s birthday is around Halloween and all the decor is out for sale, making it easier to find stuff! That said, there is so much decor out I have to figure out what is really my theme. This year we decided to go black and white just like Bella the cat. After all we have our favorite colors black and white and those are hers too! Let’s Party! I love me a good dollar store, not because anything I buy in there is going to last beyond one occasion but rather because they have so many possible options for decorating without a huge expense. There, I purchased a tablecloth that has all black and white polka dots. Then, I sought out a few pieces of decor for the middle of the table, the pretty and glitzy black cats. Balancing them was a tad tricky, but I used the mini martini cups and put the cat treats in there when it was time to eat. While Bella does not eat at our table, this night, we did put treats there so the kids could drop one by their chairs as we ate. I knew Bella would hang about then for her party! I mean, we all know some cats just come out for the treats! Last, I purchased paper plates and napkins. What I loved the most about the plates is the fact that the plates had black cats on them and of course the napkins matched the tablecloth. Also note, that everything is 100% disposable making for an easy cleanup. What would a cat birthday party be without mice? Boring! So, I found a few plastic mice and used them for table decor and of course bought a play pet mousy for her gift. For the love of birthdays, I had to get a cake. Now before all you Pet people come after me and tell me that I did not treat my baby kitty right, hold your tongue! The cake is NOT for Bella the cat, not one piece, it is for US! We humans love our birthday cake. Bella!! Happy birthday! Very enjoyable read and I hope Bella and the cat family is doing well! Just passing by and sending some warm vibes!